Make a poster indicating the number of days of imprisonment the 7 will have suffered by 14 May 2011 (7,734 days). You can also download a poster below. Take a picture or video holding this poster. 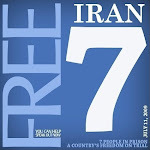 E-mail the photo to share@united4iran.org to be compiled. Contact your local media with information about your protest and the photos. Share the press coverage by sending links to share@united4iran.org.